Objectives: Women’s reproductive empowerment is an essential issue for good reproductive healthwhich is affected by various socioeconomic and cultural factors. This study was designed to compare women’s reproductive empowerment in urban and rural areas. Materials and Methods: For this descriptive-analytical study, correlational type, 810 women who were referred to health care centers in Sari - a large city in northern Iran- were recruited through proportional cluster sampling method. Data were collected using a questionnaire on women’s reproductive empowerment including four domains namely: the cultural, individual–family, social, and family planning. Data analysis was carried out using descriptive and analytical tests. 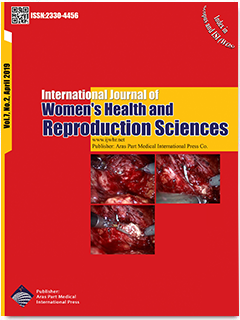 Results: The mean and standard deviation of women’s reproductive empowerment score were 91.46±13.14 (95% confidence interval: 90.55- 92.36), and no statistical difference in this regard was observed between the urban and rural women (P = 0.59). The highest 29.12(5.80) and the lowest 17.55(4.25) scores of women’s reproductive empowerment score were found in cultural and family planning domain; respectively. Women’s reproductive empowerment score was significantly correlated with the females’ employment status (P = 0.006) and their husbands’ levels of education (P < 0.001). Conclusions: Finding contributes to the discourse on women’s reproductive empowerment based on their residential area and adds to the limited literature on this issue in developing countries and Iran in particular. Appropriate planning is required for women with various employment statuses and their spouses with different educational levels to ultimately improve their empowerment in terms of reproductive issues.